The Platinum Edition line of DVDs consist of Disney's most popular films released in special 2-disc DVD box set. These sets are special in that they not only have been enhanced and restored for better quality and picture, but they are filled with tons of special features that Disney fans will undoubtedly love. A Platinum Edition release is made twice a year, in March and October, and after these films sell out, they will go back into the Disney Vault for another seven years. 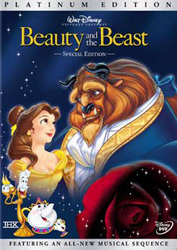 In 2002, Disney released the Platinum Edition version of Beauty and the Beast, and it is now virtually unavailable except on websites such as Amazon or eBay. The Beauty and the Beast Platinum Edition DVD was released in two versions, one was a red collector's box edition and the other was a blue DVD set. Both are filled with special features, however features differ for VHS and other language versions. Here is some information about the release. DVD Secrets. For example, the DVD Easter Eggs secret requires you to select the Cogsworth and Lumiere option on the main menu [of disc two] which leads to a long list of features. On this menu highlight, but do not select, the 'Play All' option. Press the down key to highlight the chair by the fireplace, which will then unfold the hidden feature. There are several differences between the DVD and the VHS and other Language Editions. For example, here are differences between in the VHS and the Spanish editions.